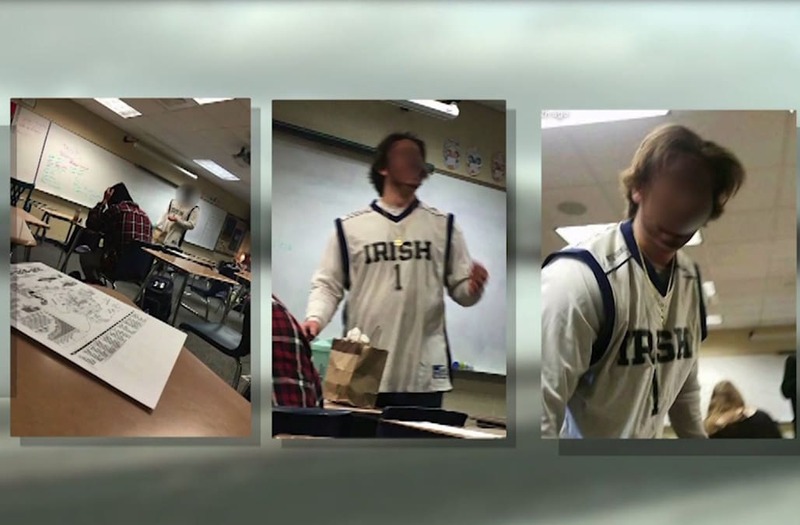 GRAND RAPIDS, Michigan (WXMI)-- Pictures of a Forest Hills Northern High School student wearing blackface in class went as viral as the criticism and disgust from students and the community. Monday Forest Hills Public Schools Superintendent Daniel Behm tells FOX 17 the district has zero tolerance for this type of behavior, after pictures surfaced Thursday on social media. "Students, community members, families feel the harm and feel the exclusion, and this dredges up a terrible history of our country, and we need to acknowledge that and we need to take steps," said Behm. "This is something that we do not tolerate, and we will take appropriate actions to remediate this situation." Many students stand with the Greater Grand Rapids NAACP and say this is wrong: wearing blackface is unacceptable, period. Pictures of a Forest Hills Northern High School student wearing blackface in class went as viral as the criticism and disgust from students and the Michigan community. "I was more so disgusted about it just because that shouldn’t happen at school or anywhere," said Danielle McMillon, a Forest Hills Northern senior. Several pictures widely shared across social media show a boy who students say is a Forest Hills Northern senior wearing blackface in class. Forest Hills Public Schools Superintendent Daniel Behm said this happened for a few minutes Thursday during a fifth hour social studies class that had a substitute teacher. "Students, community members, families feel the harm and feel the exclusion, and this dredges up a terrible history of our country, and we need to acknowledge that and we need to take steps," said Forest Hills Public Schools Superintendent Daniel Behm. "This issue is breeding a culture in which students don’t feel like they can go to school and learn," said Greater Grand Rapids NAACP Youth Council President Tavian Moore. "And it’s not one incident, it’s been multiple incidents." "I took the bathroom pass to use the bathroom and he was running down the hallway with the makeup on his face," said D'Kyah Flannel, a Forest Hills Northern junior who witnessed the incident. Several pictures widely shared across social media show a boy who students say is a Forest Hills Northern senior wearing blackface in class. Behm says this happened for a few minutes Thursday during a fifth hour social studies class that had a substitute teacher. The student found makeup another student left behind, put it on, then walked to the bathroom to wash his face. FOX 17 is not naming the student because he may be a minor and is not charged with a crime. "We have to definitely teach more about diversity, equality and all of that in school. Instead of just talking about it, we need to actually teach about it." "Northern High school does not condone or accept when persons’ actions and/or words harm another intentionally or unintentionally. We talk about Husky Pride, “The Pack”, and UBUNTU. We cannot simply use these words; we must live them. We need to respect each other as human beings and our differences of race, gender, religion, sexual orientation, or any other difference we may have. While we may not agree with each other all of the time, we can respect each other. We all need to agree that racism is not acceptable in Forest Hills." Monday morning, Gregory held a school-wide assembly condemning this behavior. Then, Behm spoke publicly with FOX 17 calling the action unacceptable Monday afternoon. "The tension at school was awkward the whole morning," McMillon told FOX 17. Yet the harm of this student wearing blackface heightens when Flannel explains how some students are not empathetic, or not willing to understand how this is hurtful behavior. "They’re just telling us we shouldn’t feel this way," said Flannel. "I don’t feel like you should be able to tell someone how they can or how they should or shouldn’t feel about a situation, especially when you don’t know because you’re not me; you’ve never experienced what I’ve experienced, simply because my skin color is different." Greater Grand Rapids NAACP Youth Council President Tavian Moore echoed students, and said this is a cultural change that must happen. "This issue is breeding a culture in which students don’t feel like they can go to school and learn," said Moore. "And it’s not one incident, it’s been multiple incidents." "Ultimately, I want the students and the staff to understand, we need to look at ourselves as community members: how can we fix this problem and make sure students aren’t feeling targeted, students aren’t feeling harassed? We all have different opinions. When it comes down to it, if certain students are feeling like these displays are disrespectful, the conversation needs to happen." Behm was unable to disclose whether the student who wore blackface was disciplined due to federal privacy laws. Moore says students organized a protest district-wide Tuesday, and ask everyone on campus to dress in black in solidarity against hurtful actions.